Looking for Hotels in Key West Florida? Historic Key West Inns will help you plan the perfect vacation! Historic Key West Inns is an extraordinary collection of six small hotels in Key West, Florida. With prime locations in the â€œOld Townâ€ section of the island, you can conveniently walk to the shopping and nightlife of Duval Street, stroll through the neighborhoods of the historic district, or reach the shoreline by walking, bicycling, or driving in any direction. With the Atlantic Ocean to the south, the Gulf of Mexico to the north, the harbor to the west, and the Florida Keys chain of islands to the east, you will be surrounded by the beauty of this charming tropical island at the southernmost tip of the continental USA. Each of the Historic Key West Inns provides comfortable accommodations within historic buildings that feature typical Key West architecture: open porches, picket fences, tin roofs, and painted shutters. Guestrooms range from modest to luxurious, with a variety of features and amenities to suit any budget or vacation indulgence. Each member hotel is unique in architecture, guestroom offerings, and amenities. All have prime locations in the Old Town section of the island, allowing guests to walk to Duval Street and most Key West attractions. All inns are AAA approved, and provide consistent levels of guest comfort and excellent service. Enjoy gas fireplaces, flat panel televisions, and the waterfall splash pool at Albury Court. Relax under overhanging palms at Key Lime Innâ€™s large pool. Spend an afternoon sipping key lime margaritas by the pool at Lighthouse Court. Be just steps away from Duval Street at Merlin Guesthouse. Surround yourself in tropical Victorian architecture at Chelsea House Pool & Gardens. 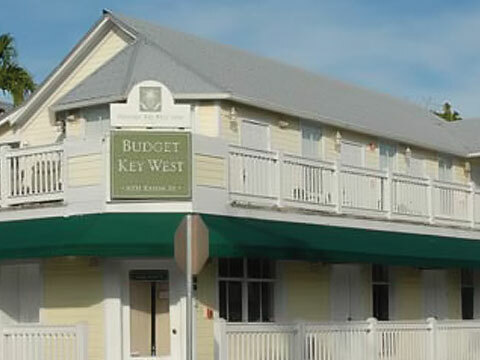 Stay chic and cheap at Budget Key West. Arrive. Relax. Be Local.